For fighter info, see Wolf (SSBB) and Wolf (SSBU). Official artworks of Wolf O'Donnell from Star Fox Zero and Star Fox Assault. Wolf O'Donnell (ウルフ・オドネル, Wolf O'Donnell) is a character from the Star Fox series. 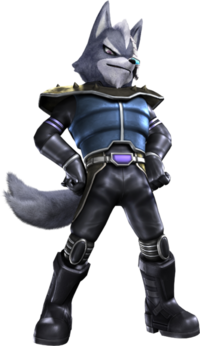 Wolf is the leader of Star Wolf, a mercenary team that are long-time rivals of Star Fox. After a cameo in Super Smash Bros. Melee, Wolf became an unlockable character in Super Smash Bros. Brawl, and returned in that capacity in Super Smash Bros. Ultimate after being absent in Super Smash Bros. 4. Wolf was originally going to appear in Star Fox 2 for the SNES. In Star Fox 2, Star Wolf is introduced as a mercenary group consisting of its leader Wolf and his wingmates Leon Powalski, Pigma Dengar and Algy. Due to the team's tenacious and unscrupulous methods, they have become feared throughout the Lylat System, with Wolf in particular being noted as someone who is willing to betray anyone for the right price. In order to ensure that his second attempt at conquering the Lylat System succeeds, Andross hires Star Wolf to intercept and kill Star Fox. Although Star Fox 2 was completely finished, it was canceled because of the Nintendo 64's impending launch and said system being more cost effective in regard to developing polygonal games. Despite this, some of Star Fox 2's features were carried over to Star Fox 64 (and Star Fox Zero by extension), including Star Wolf, while Star Fox 2 itself would later be included as part of the SNES Classic Edition in 2017. Wolf made his first canon appearance in Star Fox 64. Like in Star Fox 2, he is the leader of Star Wolf, and his team is hired by Andross to destroy Star Fox. Unlike in Star Fox 2, Wolf sports an eyepatch on his left eye instead of a large scar on his right eye, while Algy is replaced by Andrew Oikonny, Andross' nephew. Throughout the game, the player can battle Star Wolf up to two times, though there are three different battles with them overall, depending on which routes are taken on the map. Shortly after Andross' defeat on Venom, Star Wolf abandoned the Venomian Army and resumed being mercenaries willing to take on any mission regardless of legality. However, at some point, Andrew and Pigma left the team: the former sought to succeed Andross as Venom's ruler, while the latter was kicked out because of his insatiable greed. Nine years after the events of Star Fox 64, Wolf reappeared in Star Fox: Assault. During these intervening years, Wolf assumed control over the Sargasso Space Zone, an illegal hub for criminals and former members of the Venomian Army, and recruited Panther Caroso to replace Andrew and Pigma. When Star Fox went looking for Pigma (who stole a Core Memory earlier in the game), Star Wolf proceeded to face Star Fox in a dogfight over what Wolf presumed to be an invasion of his territory. Upon being defeated, Wolf called off their dogfight, but would later arrive on Corneria alongside Leon and Panther in order to save Fox McCloud from the rising threat of the Aparoids. Although Wolf said the only reason for doing this was so he could defeat Fox himself, Wolf's advice and grudging respect toward Fox nevertheless signaled his transition into an honorable, albeit still unlawful, anti-hero. After that event, Star Wolf provided backup to Star Fox at the Beltino Orbital Gate and the Aparoid Homeworld. After Star Fox successfully destroyed the Homeworld, Star Wolf was nowhere to be found. During Krystal's acknowledgement of their sacrifice as being among the many lives lost during the conflict, Fox speculated that Wolf, Leon and Panther were still alive. In Star Fox Command, Fox's assumption of Star Wolf's survival was proven correct. Following the destruction of the Aparoids, Star Wolf resumed their status as illicit mercenaries. As a result, the Cornerian Military placed a bounty for each member, with Wolf having the highest bounty set at $30,000. To avoid attention, Star Wolf set up a base on Fichina before seeking to simultaneously remove their bounties and improve their reputations. Soon after, Wolf recruited Krystal into Star Wolf following her expulsion from Star Fox over Fox's fear of her dying while on the team like his father James. With the advent of the Anglar Empire, Star Wolf sought to remove their bounties by plotting a way to defeat them. Although Command features multiple branching storylines that see Star Wolf having varying degrees of success in their bid to stop the Anglar Empire, Command's director Dylan Cuthbert stated that the game is non-canon because of said storylines rendering it as an alternate timeline-style game. In Starlink: Battle for Atlas, Wolf decides to fly solo in search of additional firepower to use for himself in the power vacuum caused by Andross' defeat. He fled to the Atlas star system to acquire a Spin Drive for his conquest of the Lylat System, and even made some allies in Atlas, such as Cash Guavo. Wolf's hideout would eventually be discovered by Star Fox and their allies from the Starlink Initiative, and his plans are ultimately foiled. Wolf, as he appears in Super Smash Bros. Melee. In Super Smash Bros. Melee's opening sequence, there is a short moment where Fox, piloting his Arwing, crosses paths with Wolf in his Wolfen, which quickly features a mugshot of the two characters in their cockpits. In the early days of Melee's lifespan, this cutscene led to much speculation of Wolf having a role in the game, perhaps as a playable character. However, this was not the case, and aside from being mentioned in the Wolfen's trophy description, Wolf makes no other appearances in Melee whatsoever. Star Wolf's Wolfen also appear on as platform in Corneria and Venom, seemingly doing battle with Star Fox in their Arwings. Wolf, as he appears in Super Smash Bros. Brawl. Wolf is an unlockable character in Super Smash Bros. Brawl who can be unlocked by playing 450 VS. Mode matches, clearing Boss Mode with Fox/Falco, or a secret door in The Ruins stage of The Subspace Emissary. Like Fox and Falco, his design is based on his appearances in Star Fox: Assault and Star Fox Command. Although appearing to be based on his rival pilots Fox and Falco, Wolf's moveset actually deviates from theirs to a noticeable degree. All of his standard attacks are different, which involve the use of his claws or legs. While his special moves follow the same basic format of Fox's, they still have significant differences. In addition to a unique model and firing animation, Wolf's Blaster has a bayonet attached that deals melee damage. Wolf Flash deviates from Fox Illusion and Falco Phantasm by propelling him diagonally instead of horizontally, and having both a powerful sweetspot that can meteor smash and an abysmally weak sourspot. Fire Wolf consists of multiple hits like Fire Fox and Fire Bird, yet contrarily lacks a flame effect. Wolf's Reflector has some notable differences. Thanks to the significant number of intangibility frames it produces, it can function as a pseudo-counter. It also sends all projectiles back at twice the speed of their initial pitch, but with a smaller damage multiplier. Lastly, Wolf's Final Smash is a Landmaster, yet deviates from Fox and Falco's by featuring a red color scheme, much greater power, and a shorter duration. Wolf's physical attributes are also quite different from Fox and Falco's. He is a rather heavy character, yet boasts great air speed that gives him superior mobility. Wolf is currently ranked 14th on the current tier list, placing him in the C tier. Wolf is a borderline viable character, who has the tools to take on any character in the game, including Meta Knight, with his great mobility, fast and far reaching attacks, and a plethora of options. However, Wolf has a severe weakness to chain throws, including multiple zero-deaths, which leads to him being countered by a few characters that can exploit this, most notoriously King Dedede. A pilot whose real name is Wolf O'Donnell. He leads a group of mercenaries called Star Wolf. He's crossed paths with Fox many times, and each acknowledges the other as a competent rival. Wolf's constant interference with Fox is a result of Wolf's history with Fox's dad, James. Wolf's long history of criminal enterprise has resulted in a large bounty on his head. 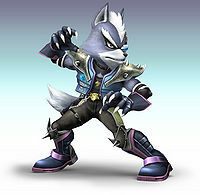 Unlike Fox and Falco, Wolf did not return as a playable character in Super Smash Bros. 4. His only direct appearances in SSB4 are as a trophy using his design from Star Fox: Assault in both versions, and via Lylat Cruise's Star Fox Smash Taunt. Music associated with Wolf is also present for both Orbital Gate Assault and Lylat Cruise in Super Smash Bros. for Wii U. Outside of these instances, Wolf is also referenced via gameplay: one of Fox's new alternate costumes highly resembles Wolf's color scheme, while Wolf Flash is one of Fox Illusion's custom variations. Wolf's trophy in Super Smash Bros. 4. Wolf used to fight in Andross's army, tangling with Star Fox in battle after battle. After Andross's exile, he went his own way and formed a mercenary team called Star Wolf. He and his eternal rival, Fox, have even fought on the same side from time to time...but inevitably, they always meet again as enemies. Wolf used to fight in Andross's army, where he tangled with Star Fox in many a dogfight. 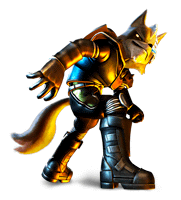 After Andross's exile, he went his own way and formed a mercenary team called Star Wolf. He and his eternal rival Fox have even fought on the same side from time to time...but inevitably, they always meet again as enemies. Wolf, as he appears in Super Smash Bros. Ultimate. Wolf returns as a playable character in Super Smash Bros. Ultimate. This marks his first playable appearance in 10 years, a distinction shared with the Ice Climbers. Like Fox and Falco, Wolf's design has been updated to reference Star Fox Zero. 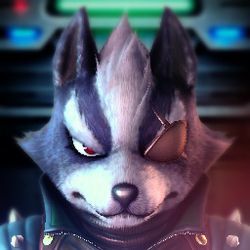 In Wolf's case, he once again has a normal eyepatch, his right eye is slightly larger and colored red, his muzzle is slightly longer, and his skull shape is once again akin to a wolf's instead of the slightly humanoid shape first seen in Star Fox: Assault. 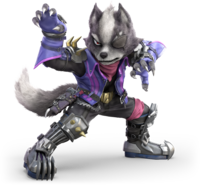 Unlike Fox and Falco, however, Wolf's attire is entirely original to Ultimate, even though Starlink: Battle for Atlas was released almost a whole month before Ultimate and fully depicted him in attire based on his appearance in Zero. Wolf is the only antagonistic playable non-human mammalian character, not counting any Pokémon (as they, by nature, are not morally aligned). This page was last edited on April 21, 2019, at 16:44.